I just bought a pair of earrings from this shop a week ago and I’m so excited for them to come! They have so many lovely pairs up for sale on their shop that I totally recommend checking out. And they aren’t just YA, but there’s also tons of earrings from classic literature as well! There are so many great bookish candle shops out there. I don’t own any, but if I did, I would definitely buy them from this shop first. Just look how beautiful they are, and they all sound amazing! Magnetic Bookmarks from Happy Hello Co. I have a few bookmarks from this shop and I love them! They’re super adorable but also super useful. I recommend these to just about anyone. Also, the bookmarks aren’t just based off of bookish characters, but there are also movie characters, animals, food, and tons of others. I absolutely love all of her designs! I don’t own anything from Evie’s shop, but everything is so beautiful, I definitely want to! Not only can you find beautiful pillow, art print, and mugs, but you can also find everything from wall clocks to phone cases to totebags and just about everything else. Litographs sells shirts (also tote bags, art prints, and scarves) with the words of books on them in the shape of a design related to said book (forgive me, I have no clue how to describe them). I love these designs from Throne of Glass, Cinder, and Red Queen, but you can also find more designs based on YA fiction and classic literature of every sort. 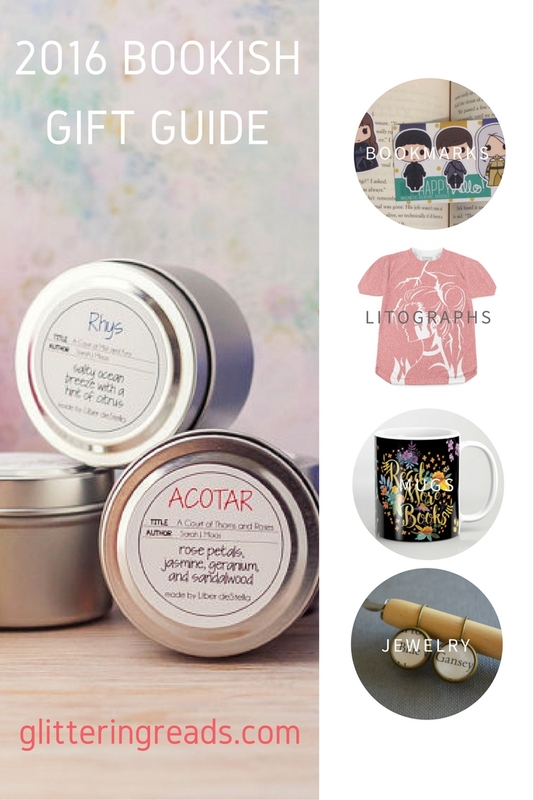 So, there are some of my favorite bookish shops that I recommend checking out this holiday season! Each shop sells their own unique products perfect for any YA book lover out there. What are some of your bookish shops? Any you think I’m missing, because i know I left out a ton!? Oh my goodness, those bookmarks are so cute! Thank you for introducing me to this adorable store! Aren’t they just adorable? I absolutely love the ones I have from this shop! Great list! I’m a big fan of Evie’s designs on Society6 too. That pillow is gorgeous! Really? Well I’m glad I introduced you to all of them! I’m still making my way down this list myself. I love bookish candles! I wish I could get them, but no candles allowed in my dorm room, and as little as I’m home, it’s not worth it. And I absolutely love Evie Seo’s designs! I really need a travel mug, so I’m thinking of getting something from her store. Another favorite of mine is Paper Fury’s store – I haven’t bought anything yet, but it’s all so pretty!